The 'Desaru ship' is a Chinese vessel which sank in the 1840s with a cargo of Chinese ceramics. Desaru is the name of a town near which the wreck was found, in the southeast of Johor in Peninsular Malaysia. Artifacts from the Desaru ship are on display at the Maritime Archaeology Malaysia exhibition at Muzium Negara, Kuala Lumpur. Below is a teapot recovered from the shipwreck, among blue and white porcelain ware. 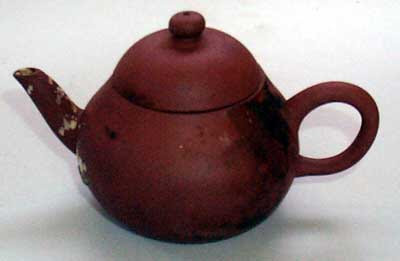 Chinese Yixing teapots from Jiangsu province. Various potters' marks and seals appear on the base. These pots are handmade and beaten into the desired shape, usually by famous potters specializing in teapot making. 15 - Small: 4-6 cm high. 15.1 - Medium: 8-10 cm high. 15.2 - Large: 10-12 cm high.